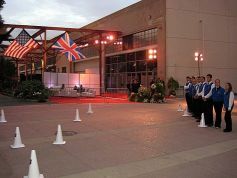 On July 22, 2007 Chuck's Parking Service provided valet parking for the David Beckham Welcome to America party thrown by Tom Cruise, Katie Holmes, Will Smith and Jada Pinkett-Smith. The event was held at the Geffen Museum of Contemporary Art in downtown Los Angeles. The event was attended by over 700 people. Chuck's Parking worked in conjunction with the Los Angeles Police Department to coordinate the movement of all the personal vehicles and limo drivers as well.